Anyone that knows me, knows that I LOVE moose! Ok, maybe I’m a bit of a moose fanatic. How could I not be?!?! I seem to see them on most outdoor adventures we go on. They seem to sense that I am a friend and just have to come out to be seen. Really. Lately, I have been seeing “mama bear” items everywhere; shirts, bumper stickers, home decor. 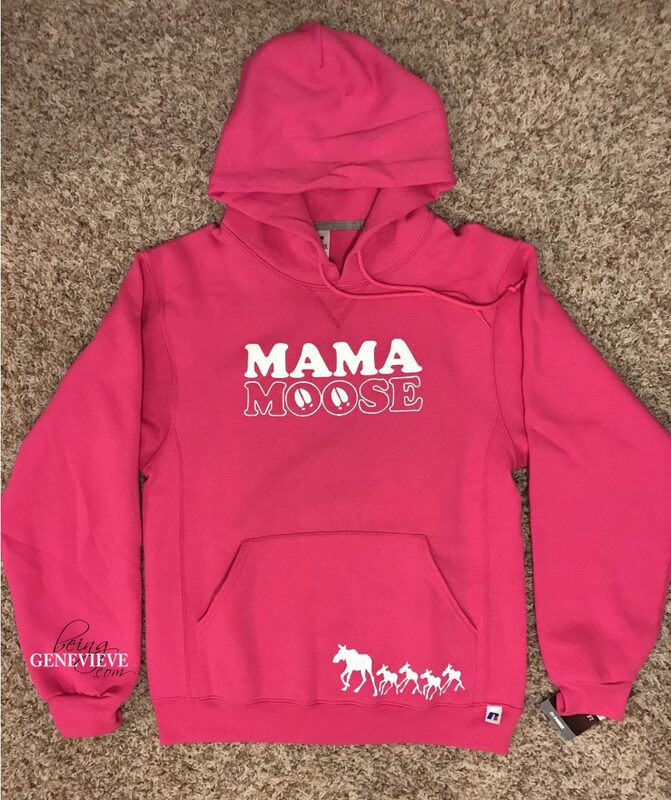 So I decided I would take a little bit of a twist to the items I’ve seen and make myself a mama moose hoodie. I first bought a bright pink, very comfortable hoodie. I then went to work designing what I wanted my mama moose image to look like. I ended up putting moose hoof prints in the center of the o’s at the last minute, as a suggestion from my husband. I just love how it turned out! I also wanted to put something on the hoodie showing my little herd. 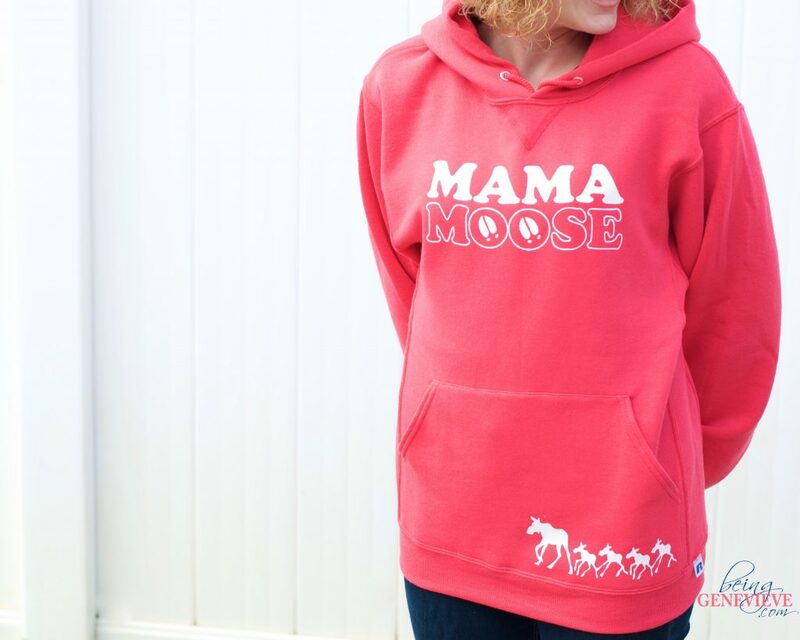 I ended up designing a mama moose with four little calves (to represent my four little boys) following her. I placed this on the bottom-side of the front pocket as a little something extra. This helped customize the hoodie to me. Note: I took pictures of the entire process, but just upgraded my phone and can’t seem to find any of them. SORRY! Luckily it’s the exact same procedure as my Disneyland Shirts. 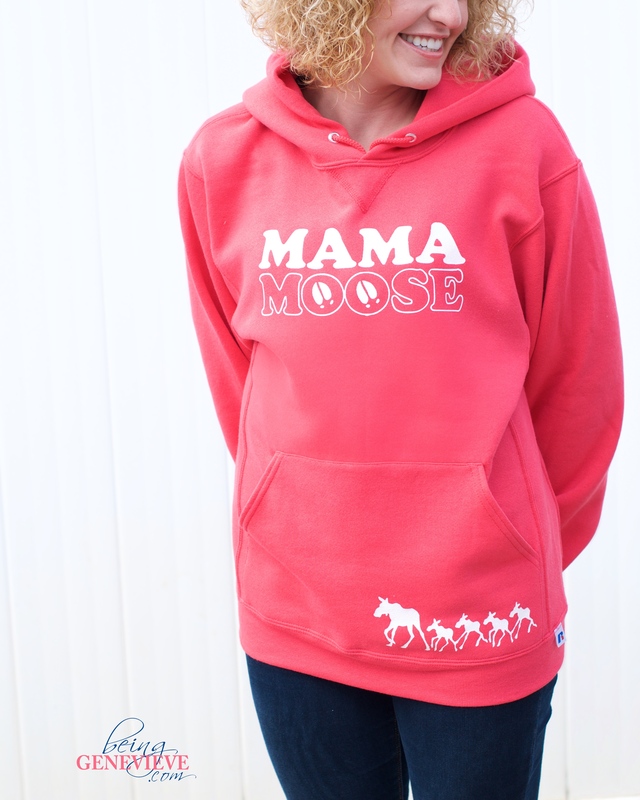 For the mama moose and calves, I decided I wanted them to not quite reach the middle of the hoodie pocket. I measured and came up with the length of 7″. Now place the template on the hoodie. If using freezer paper, iron it into place. 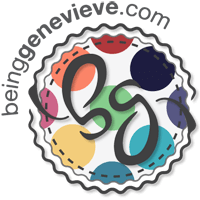 If using vinyl, stick it on using this method with tacky spray. I also have a video here that shows how I do it using another shirt I made. I then used my favorite screen printing paint and just painted it on with a paint brush. Do it thick enough that you can’t see the shirt color from behind, but don’t do it too thick that it will just peel off later. Allow to dry for about 12-24 hours. Now it’s ready to be worn, washed, dried, just whatever and it should hold up better than a store bought screen printed shirt. Really.